Resveratrol is a polyphenolic compound belonging to the class of stilbenes that has been found to have strong antioxidant power. It is produced by plants in response to injury, fungal infection, UV radiation or stressful growing conditions. Resveratrol molecule occurs in two configurations: cis- and trans-resveratrol. Researchers have identified trans-resveratrol as a biologically active form. - resveratrol inhibited the platelet aggregation which is one of the first steps in the formation of blood clots. However, it has been demonstrated that resveratrol's bioavailability in humans is relatively low because after oral administration it metabolizes quickly and is eliminated from the body. The study "Metabolism and Bioavailability of Trans-resveratrol" Wenzel E et al. published by the German Research Center of Food Chemistry in 2005 concluded that "...Around 75% of this polyphenol are excreted via feces and urine. The oral bioavailability of resveratrol is almost zero due to rapid and extensive metabolism and the consequent formation of various metabolites as resveratrol glucuronides and resveratrol sulfates. The potential biologic activity of resveratrol conjugates should be considered in future investigations." Study: High absorption but very low bioavailability of oral resveratrol in humans. This is a very important fact for the future research on resveratrol with humans as most of the initial research that showed such promising results mentioned above has been performed in cultured cells exposed to extremely high concentrations of unmetabolized (unchanged) resveratrol - 10 to 100 times higher than what was observed at peak concentration in human blood after consumption. And it is not known yet if human cells are capable of transforming metabolized resveratrol back to its original form. Antioxidant activity of resveratrol has been observed in test tube trials where this polyphenol successfully acted as a scavenger of free radicals and prevented oxidation of LDL (bad cholesterol). There is not enough evidence that it has the same effect in live models. Also, scientists speculate that metabolized resveratrol that circulates in bloodstream may have lower antioxidant powers than the unchanged one. 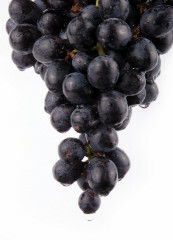 Food sources of resveratrol: red grapes (skins), red wines, red grape juice, peanuts (raw and boiled), peanut butter, blueberries, bilberries, and cranberries. Concentrations of resveratrol in these foods is very low compared to dosages used in lab experiments. For example, 5 oz. 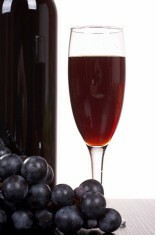 glass of red wine contains on average 0.3-1.07 mg of resveratrol; 5 oz. glass of red grape juice - 0.17-1.3 mg; 1 cup of red grapes - 0.24-1.25 mg; 1 cup of boiled peanuts - 0.32-1.28 mg; 1 cup of peanut butter - 0.04-0.13 mg.
For the sake of comparison, in the study "High absorption but very low bioavailability of oral resveratrol in humans" (see the link above) six healthy men and women took an oral dose of 25 mg of trans-resveratrol, and only traces of the unmetabolized (unchanged) resveratrol were detected in their blood. Resveratrol supplements may contain anywhere from 100-500 mg of resveratrol, but the effective doses for chronic disease prevention in humans and the safety of long-term supplements use are not known. Important: in cell culture experiments resveratrol has been found to act as an estrogen agonist under some conditions and an estrogen antagonist under other conditions. Until more is known about resveratrol's estrogenic activity women with a history of estrogen-sensitive cancers (breast, ovarian, and uterine cancers) should avoid resveratrol supplements.